A romance novel by an Amish writer, based on true experiences! It isn’t that Lizzie doesn’t want to stay Amish. It’s just that there is so much to figure out. Like why can’t she let her hair a little looser on top? And why can’t she wear shoes with a little bit more of a heel? And will she ever really just know for a fact who she is going to marry like her next-older sister, Emma, does? And how does it happen that her just-younger sister, Mandy, is going on a date before Lizzie ever has a real one? So does it matter at all if she’s fat and eats another whoopie pie? Amos seems to like her a lot when she pounds out the ping-pong games. He even asks her to be his partner in doubles. But then he asks Ruthie if he can take her home! It has been this way Lizzie’s whole life. She has too hot a temper. She hates housework and dislikes babies. She loves driving fast horses but is petrified of going away from home for a week to work as a maud (maid). What will become of Lizzie? Isn’t she too spirited, too innocent, and too uninhibited for a young Amish woman? About the Author: Linda Byler is an active member of the Amish church. 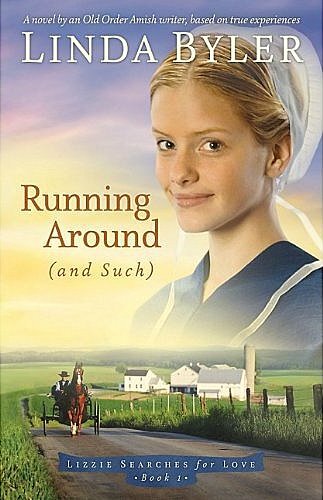 She writes about the culture and convictions of Amish society with accuracy, insight, compassion and candor. She reveals well rounded people with the same hopes and dreams and wants and needs as “Englishers”. The only difference between the cultures is the faith-based tenants used for measuring and meeting those needs. , by Linda Byler. I read it from cover to cover. It didn’t bore me, but it didn’t thrill me, either. Part of my mixed feelings about this book have to do with the main character, Lizzie. I didn’t much like her. Lizzie is very self-centered and often ignorant of the wants, needs and expectations of others. She is a whiner, shirks her duties and plays the “I’m ugly and no one loves me” card way too often. She irritated me and I wanted someone to tell her what’s what. In fact, one of the reasons I kept reading the book was my expectation that someone would tell her what’s what and instigate change. Story is supposed to be driven by character change. Since this is a sweeping, three-book coming-of-age saga, Lizzie isn’t showing as much change in this first book as I wanted her to. Even so, she is making progress and I have faith that she will change before the end of book three. Byler’s writing style is clean, easy to read and very visual. Her characters are lively and well drawn. Yet, despite those pluses, her storytelling techniques left me confused on more than one occasion. She jumps back and forth through time with little or no warning to the reader. Often Byler tells the end of an event and then goes back to tell the beginning. At first her muddy timelines had me going “huh” and rereading, but that got to be too much work so I just continued on without clarifying issues. Doing so didn’t seem to impair my overall comprehension of the story. There were also a couple of instances in the book when details changed from one section of story to the next. For instance: Lizzie and her sister went to be mauds (maids) in a brand new home. They were to help the farmwife with setting up and painting her “new, built only a few month earlier” farmhouse, yet somehow the walls the girls painted “were old plaster with deep cracks, some broken spots, and peeling paint”. Why would anyone put up (and how could they put up) old plaster walls in a brand new home? I guess the best way to sum my review up is to tell you that I plan to read book two in this series and I will likely read book three as well because I have seen some positive changes in Lizzie and I have come to care about her and her family. However, I cannot, in good conscience, recommend this book without warning you that it isn’t a stellar read. Interesting and very fair review. Linda — this review was hard to write. Despite the many flaws of the book, and the fact that I don’t really like Lizzie, I have come to care about her and I am interested in reading more. Byler’s writing style is straight-forward and yet confusing at the same time. Her description is vivid and visual, yet the way she jumps around in time — and in and out of different character’s heads — can be quite distracting. Like Lizzie herself, the book is a major study in contradictions. Your honest and thorough reviews are the reason I like to read what you have to say about books. I know you will not steer* us wrong. *good grief! There’s that word again! You’d think I lived on a cattle farm. It’s a shame. Sounds like she didn’t have a very good editor.